From January 13th, 2013 it will be possible to register .CA domains with French special accents and characters such as “à” and “â”. 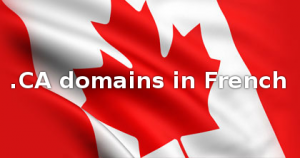 With the introduction, every French character variant of a registered .CA domain will be bundled and automatically reserved for the registrant of the identical ASCII domain. If you are the holder of a current .CA domain, you will automatically have the exclusive rights to the special characters variants of that name. However, in order to use the domains they need to be registered and thus resolve. According to Canadian Internet Registration Authority (CIRA), recently Canadian TLD has broken the 2 Million mark for registered .CA Internet domain names. Canada is the fourth fastest-growing Internet domain name registry in the world. It took over 20 years to reach 1 million .CA domains and just four years to double the number. Research shows Canadians and those who use local proxy service to avoid domain restrictions, prefer .CA sites for online news, banking and shopping. Internet space is rapidly rising adoption of .CA domain names for personal and business usage. When the French IDN is introduced, this astonishing growth rate is considered to increase even faster. The .CA domain was created at the University of British Columbia in 1987. To register .CA domain, local presence or a local trademark is required. Web Solutions further offer a Trustee Service for .CA domains. Use the domain name search form located below where you can register new .CA domain name or contact our support team at support@web-solutions.eu on how to register your IDN .CA domain.